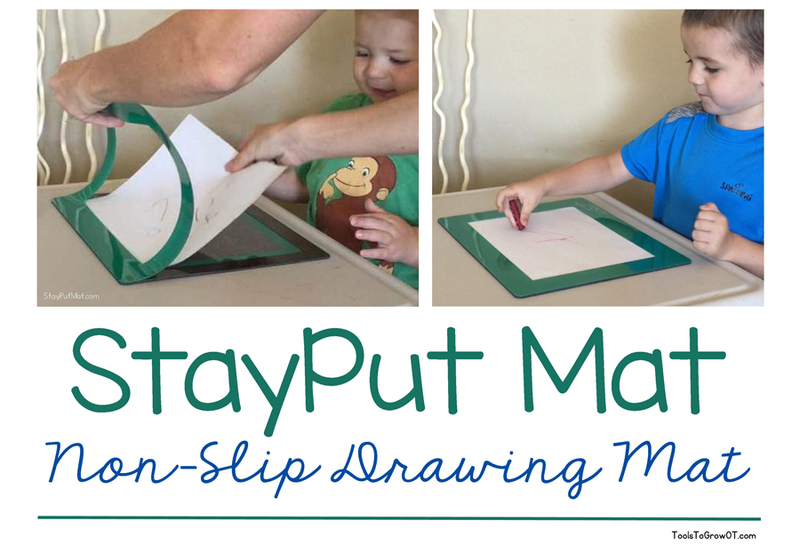 StayPut Mat: Non-slip Drawing Mat for Children | Blog | Tools To Grow, Inc.
Tools to Grow is pleased to present a guest blog by Courtney Luper, a resourceful mother that designed a product that we are sure will be of interest to Occupational Therapists. I am a mom of 2 awesome boys, 2 and 4 years old. They love to stay busy and be creative. Our days are often filled with repeat sessions of coloring and painting. During each session, I would tape (and re-tape) the paper to the table to keep it from sliding around. When it slid around, it not only frustrated my young kiddos, it also would knock paints and crayons off the table. I thought to myself..."I wish I had a non-slip mat that I could simply insert a handful of paper in for the kids to draw on." I immediately went to Amazon to buy one and found that no such thing exists. After searching a bit more, with no luck, I decided I was going to make one myself! So I did! ...The StayPut Mat. Preschools loved it for the ease of use and efficiency of time, stacking multiple papers in the mat for all day use. Occupational therapists loved it for a stepping stone in a child's writing & drawing development. Skilled Nursing Facilities loved it to help give their patients independence again with loss of limb function. New Moms loved it when they spend most their day holding a baby, yet still need to write a grocery list or "honey-do list." It brings me joy to see so many great uses. It also brings me joy to see my young kids draw me creative pictures with the help of the StayPut Mat. I'd love to see any of the creative uses or masterpieces you or your kiddos come up with! Please share.